J is for "jay" or more specifically, a blue jay! 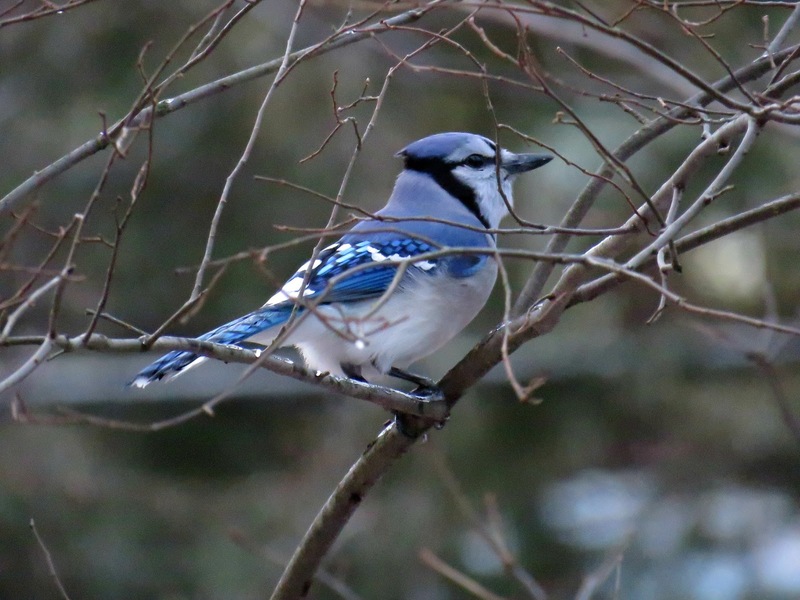 The blue jay is the only jay that calls Massachusetts its habitat, though they are widespread along the east cost, the south and the midwest. They live here all year long and do not seem to be afraid of a little snow! 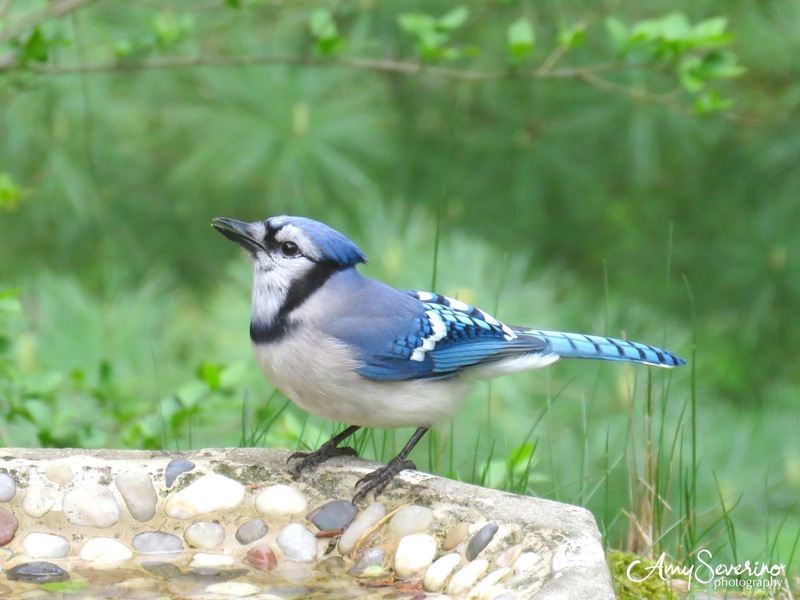 Known for their feisty and loud behavior, the blue jay is a common back yard visitor. 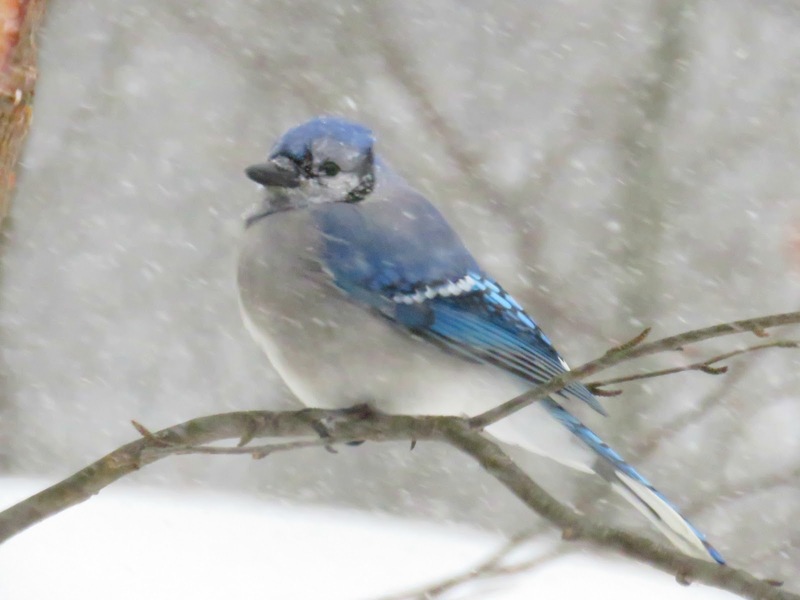 There is a crew of about 8-10 blue jays that visits my yard on a daily basis, scaring all the smaller birds away. There were at least 20 blue jays squawking (though you can only see 7 in this photo). 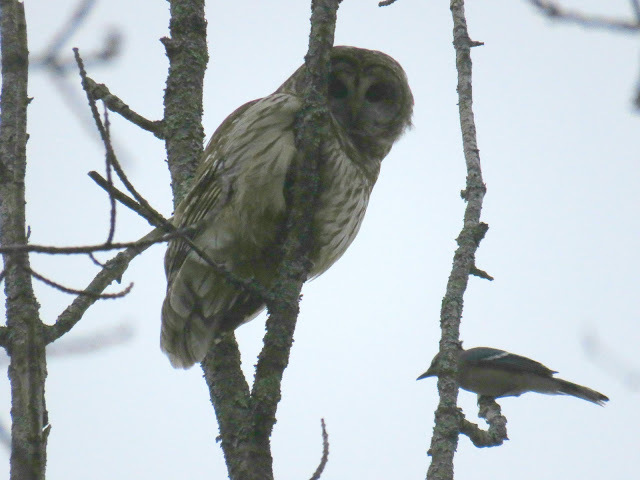 And there, smack dab in the middle was a wonderfully calm, magnificent barred owl. 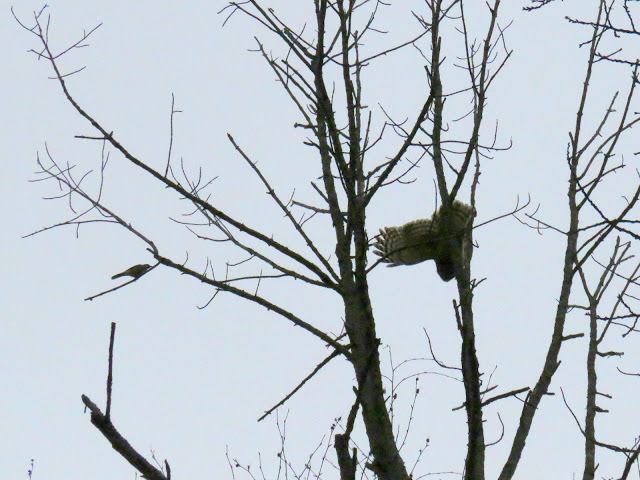 These jays were mercilessly mobbing the owl. A technique smaller birds often use to shoo away a bird of prey, out of concern for their own safety. It finally worked and the owl eventually flew away into the woods and the blue jays peacefully enjoyed their birdseed. I was in awe of the blue jays' brazen behavior, but even more in awe of the beautiful barred owl sitting on the tree just a few feet from my deck! 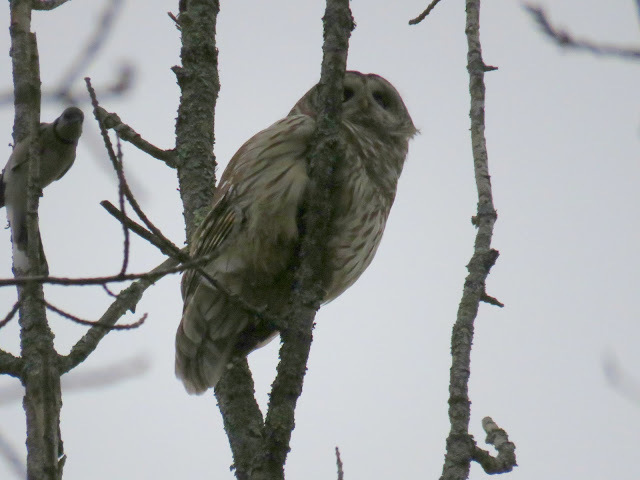 I am aware of barred owls in the vicinity of my yard as my whole family hears them quite often. But this visit was a wonderful treat! I hope you will visit tomorrow to see what flies in on the letter K.
In honor of my barred owl/blue jay story, here are a pair of owl earrings. 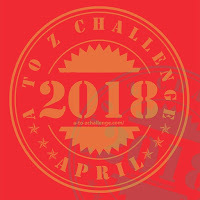 Anyone who comments during the A-Z challenge will be entered in a drawing for seven pairs of earrings! Our blue jays have an interesting behavior. 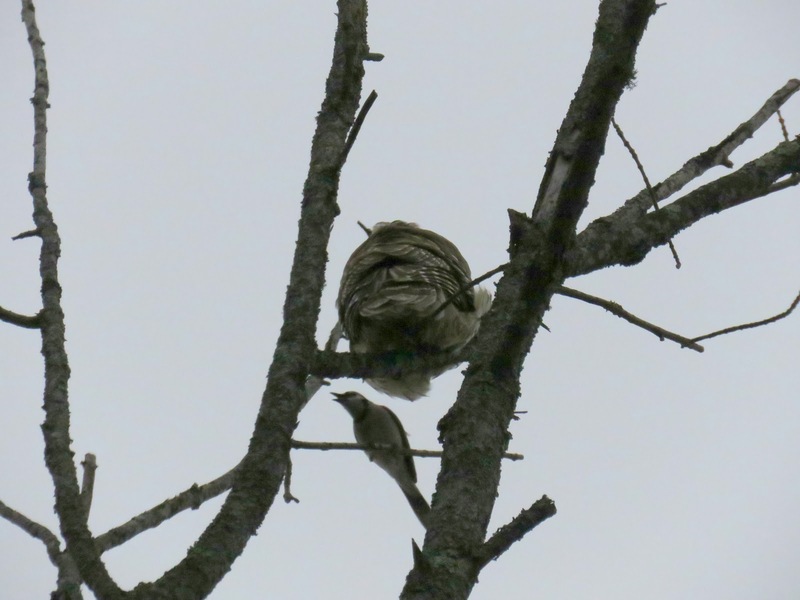 If there is a large predator bird, unfamiar cat or any perceived threat one the jay parents will fly to a tree away from the nest and make a terrible racket. I have always loved the look of blue jays! I was at the dentist once and was commenting on the blue jay outside the window I was looking at, and the lady working on my teeth told me that a few days before, she had a little boy about 4 or 5 in her chair and a blue jay pecked another small bird to DEATH just for sitting on the branch lower than it. Ever since then my affection for them has waned a little bit hehe. How cool was that?!? 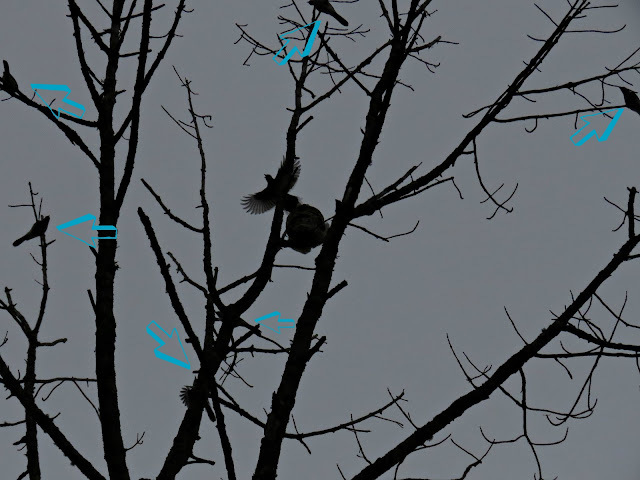 You are good at getting multiple birds into a post...and good at seeing exciting bird activity! LOVE the owl earrings!!! Out in WA we had the really cool and large all blue Stellar's Jay. They're so pretty! We've got tons of blue jays here too. I had no idea there were other types of jays. 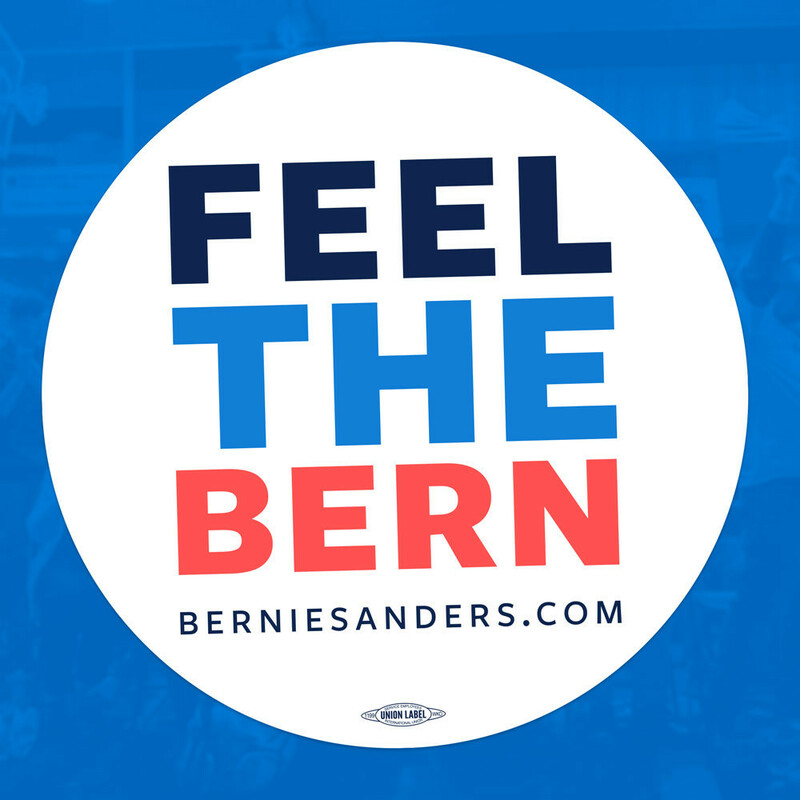 I guess that makes sense since it had the "blue" distinguisher in its name. But, I've never heard of any other. I've seen Mockingbirds (we have TONS of those down here) behave like that and go after a lager bird or one near their nests. The sighting of the owl is the best though. I do love me an owl. It's a shame they're so hard to spot since they're nocturnal!